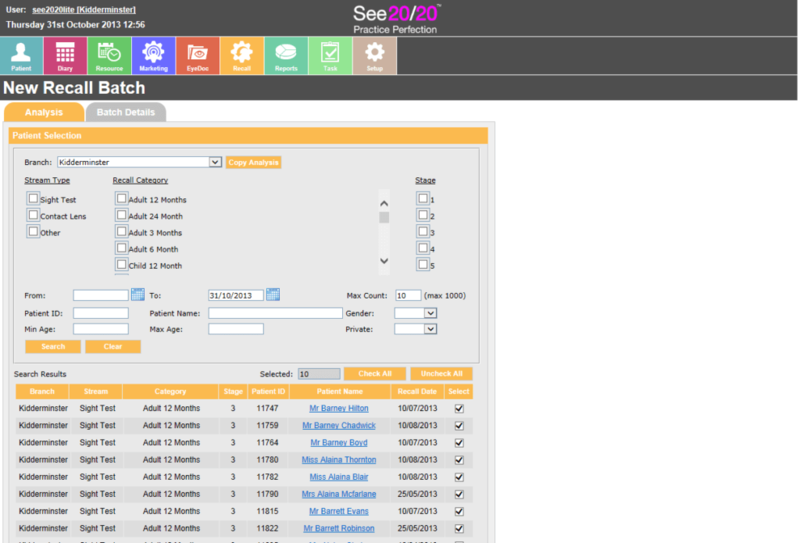 Staff availability and patient appointment scheduling is combined in See2020's dynamic scheduling system. Fully integrated with resource and patient recall functions. This comprehensive module is at the heart of See2020. Access, track and control all patient information, including benefit claims, transactions and histories from any location. Simple, flexible and easy to use. The Recall and Marketing module maintains recall patients, creates marketing campaigns and generates letters, SMS and emails. An uncomplicated system allowing users to attach any file type to a patient record. JPEG, Tiff, PDF, HTML, WAV and scanned paper records can be securely uploaded with this web based system. Flexible, quick and easy to use. All of the advantages of using paper based records to records, including touch screen compatibility, with the security and reliability of an electronic record. The numerous validated catalogues are maintained by the suppliers themselves. External prescription dispensing and recording. Automated stock integration with EPOS. This can be used as a stand-alone EPOS till and stock system, or can integrate with patient records, NHS payments and dispensing to offer instant control of all sales activity. Set up and configure any type of plan for any product or service, with minimal staff interference. Track your DD movements, cancelations, and history anywhere anytime. Provides a comprehensive view of business data and supports operational, managed, planning, budget, forecast and ad-hoc reporting. Business critical decision making tool. The appointment booking & resource management system allows users to link their staff resources with a fully dynamic appointment diary where they can monitor and forecast trends, maximising the revenue accrued from patient appointment bookings. Appointments can be booked from any location with every possible working pattern reproduced, giving complete flexibility and control to the user. 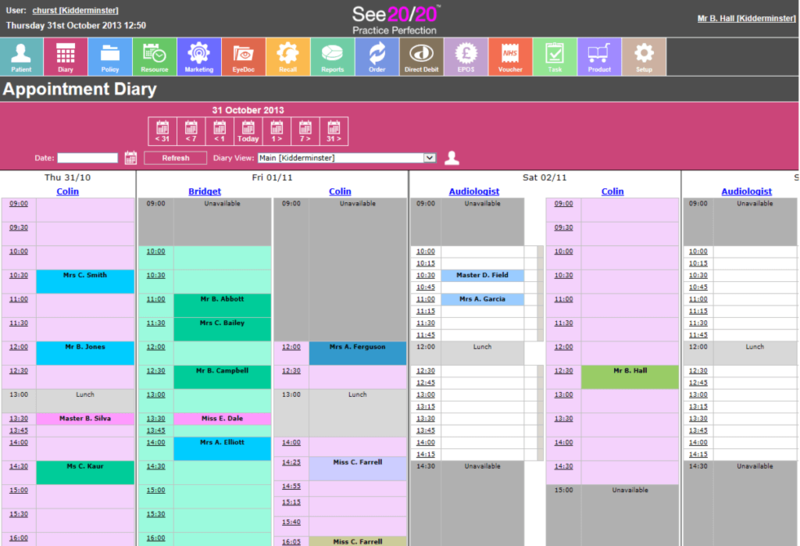 The scheduler offers a comprehensive range of features including automatic text message (SMS) appointment reminders; multiple configurations of diary setup between shift, staff member or room; unlimited and defined diary views with unlimited days, call centre and practice combined booking facilities, allowing appointments to be made between branches; integrated staff scheduling (holidays, sickness, etc. ); and overflow appointments which can be utilised as a free format booking system. 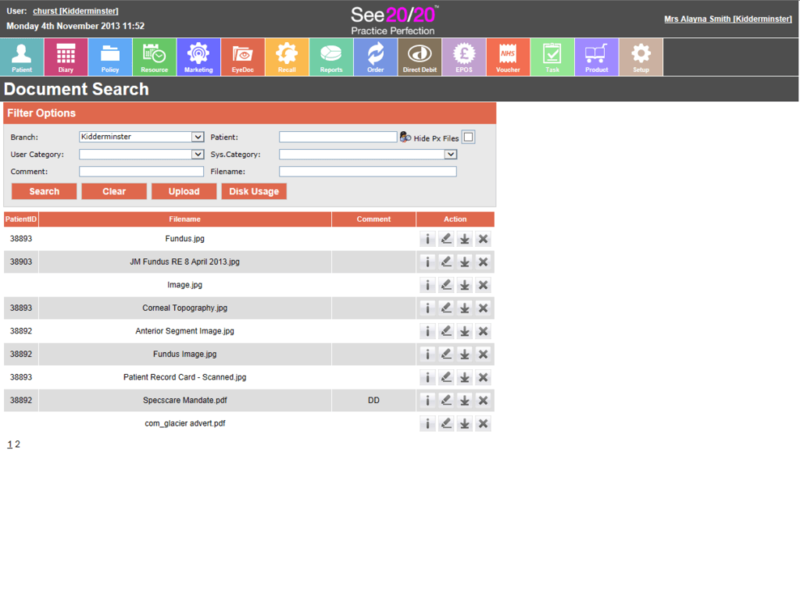 The EyeDoc Manager works with Patient Management, allowing attachments of any file type (i.e. JPEG, TIFF, PDF, HTML, WAV and scanned paper records, to be securely uploaded to cloud storage. These records can be uploaded and stored for either individual patients or centrally for internal use. Securely stored on the cloud, these records are available online to the practice’s registered users and can be accessed online whenever they are required. 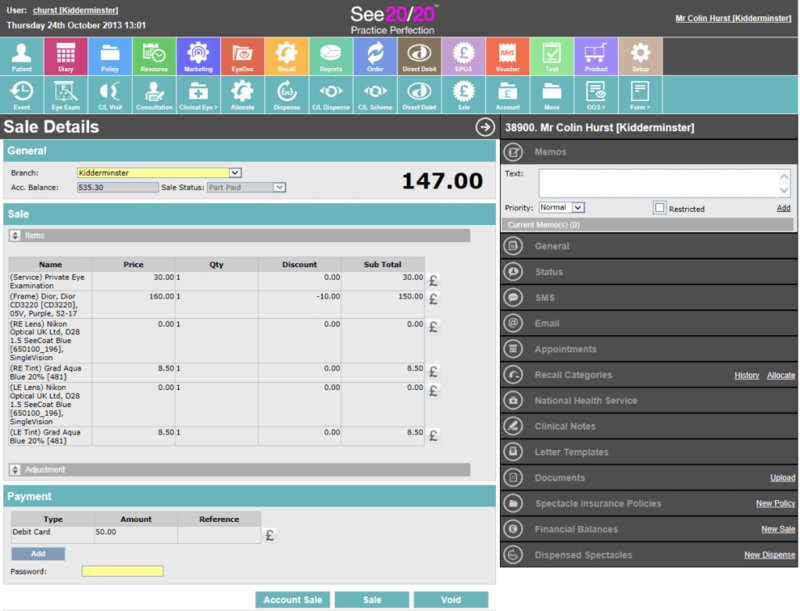 See20/20 Payments Manager can be used as a stand-alone EPoS, till and stock system, or can be fully integrated with patient records, NHS payments and dispensing; giving complete control of all sales activity and patient management. Adaptable to any practices sales functions, offering instant product entry and real-time information on all aspects of daily sales, and providing an array of KPI and management reports; the payment manager affords users the ability to their business pro-actively. Practices can replace their conventional till with this space saving module. Supports walk-in as well as patient sales, which can be processed from any workstation in the practice. Payment on patient accounts with deposit and part payment options, the system tracking patients with credits and debits against their record. User defined security levels for all till functions with an audit trail allowing all transactions, and the users responsible, to be tracked. This comprehensive module is at the core of the See20/20 system, holding detailed and accurate patient information securely in this cloud based system, providing instant access for any registered user from any device with internet access. Quick and easy to search for, and update, patient records; the patient management feature cuts down on time and effort spent wading through patient archives to find the required information, maximising practice efficiency. 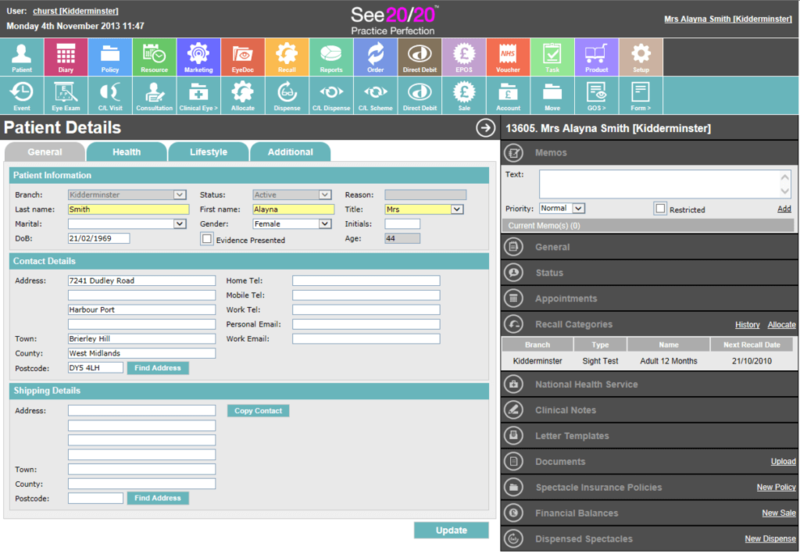 The benefits of the See20/20 Patient Management feature include: automatic postcode addressing, event tracking for all patient functions, ability to generate any bespoke form (i.e.GP referral letters, NHS, etc. ), detailed history of all patient communication and transactions, complete records of all patient examination details including prescription, clinical notes and history, automatic NHS entitlement calculator, and many more. Clinical Notes was developed with optometrists to provide a system that retained the speed and flexibility of the paper counterpart, alongside the inherent security, easy retrieval and convenience advantages of an electronic record. Clinical notes is adaptable to the individual using it, be they an optometrist, contact lens optician or optical assistant. 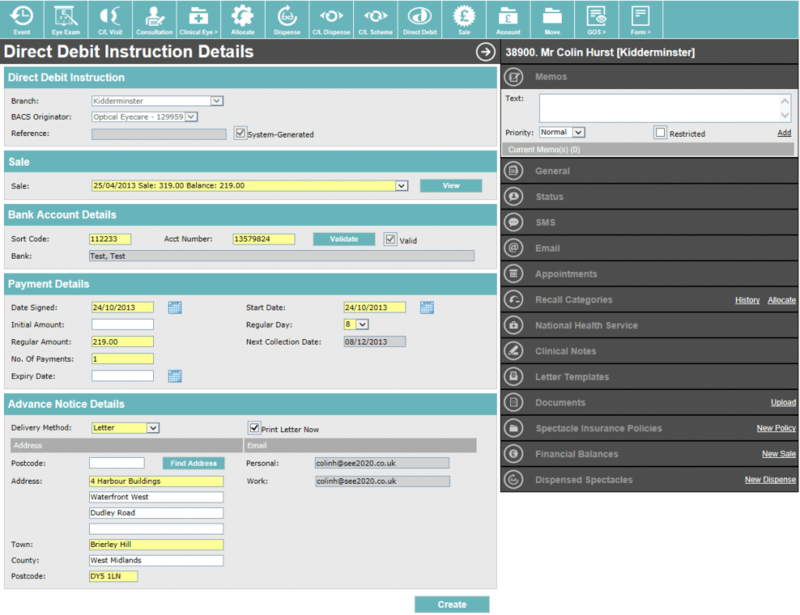 It is easy to use and can be configured to cater for any working method. 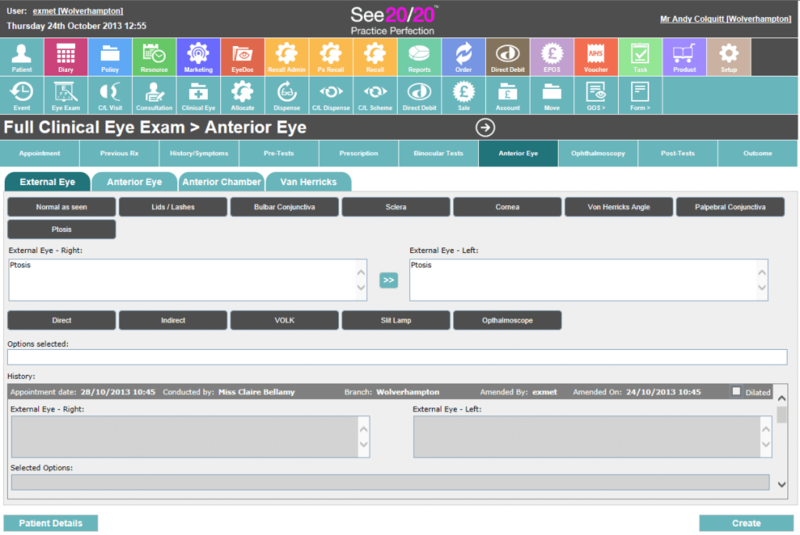 Some of the benefits of See20/20’s Clinical Notes feature include: greatly reduced examination and administration times, full access to previous exam history with a copy function for faster data entry, the ability to upload scanned documents and images, touch screen compatibility, an audit trail so that changes to the record can be traced to who updated it and when, a printable summary of the full examination, and an elimination of errors due to rushed or illegible handwriting. The Direct Debits Payment Manager provides the user with completed control of their direct debit processes. Setting up and configuring plans for any product or service is extensively automated and requires a minimum of staff input. The module uses an auto-bank recognition system using the patients account number and sort code, setting the payment amounts and schedule through the printing of the mandate, or using AUDDIS paperless Direct Debits (AUDDIS being dependent upon the facilities provided by the customer’s bank). Instant access to all DD information including history, details of collections made, mandates failed, on hold or cancelled, and any and all other relevant information on a patient’s plan or plans. All future payments are requested and processed on the day of the user’s choosing (set at the time of the initial sign up) without the need for human operation. This feature effectively maintains patient return visits and helps to deliver the full potential patient revenue for your practice. Allocating patients to the correct recall and marketing categories, creating professional media that will not be mistaken for spam, and delivering effective reminders and marketing collateral staggered appropriately. The Recall & Marketing feature is simple, flexible and easy to use, has unlimited recall stages and three concurrent stages for each patient. Recalls can be processed for any branch from anywhere with an internet connection and these Recalls can be reset easily, should the need arise. Users can create marketing campaigns using multiple filters (i.e. lifestyle, age, hobbies, etc.). These recalls and marketing collaterals can be generated as printed letters, SMS text messages, labels, exported reports (i.e. phone list) or mail fulfilment; the integrated mail fulfilment option for recall and marketing at only 49p, the customer receiving the mail fulfilment letter within 2 working days. See2020 reduces the time consuming paperwork and administration involved in spectacle dispensing allowing users to spend more time focusing on the patient; increasing the potential for the practice preferred frames and lenses being selected, achieving the best potential sales revenue per customer. The numerous validated supplier catalogues are managed by the suppliers themselves (Hawkstone), eliminating both the need for time consuming product entry, and the possibility of user errors when recording these products. 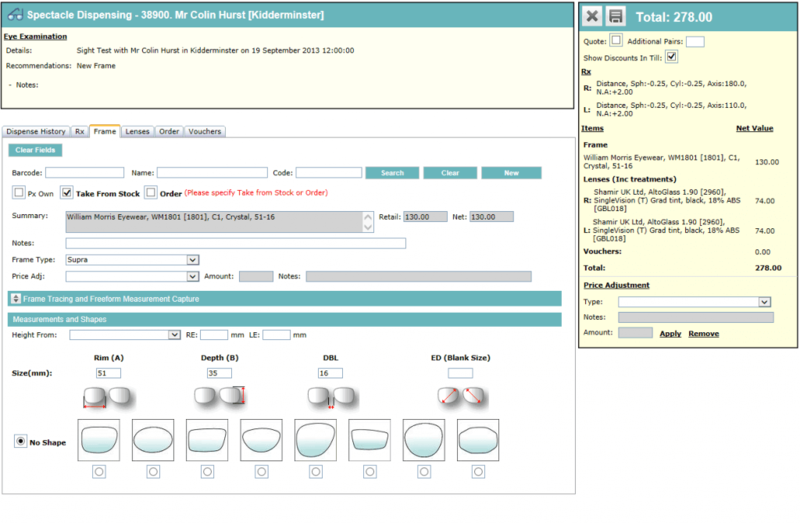 The Dispensing and Ordering feature incorporates a fully maintained lens catalogue from all major suppliers, bar-coding for quick entry and stock takes, multiple pair dispensing per patient facility, automatic stock deduction, seamless integration to EPoS and EDI Ordering, external prescription dispensing, audit trail for all dispenses recorded, and the facility to create customised catalogues for quick product searching. 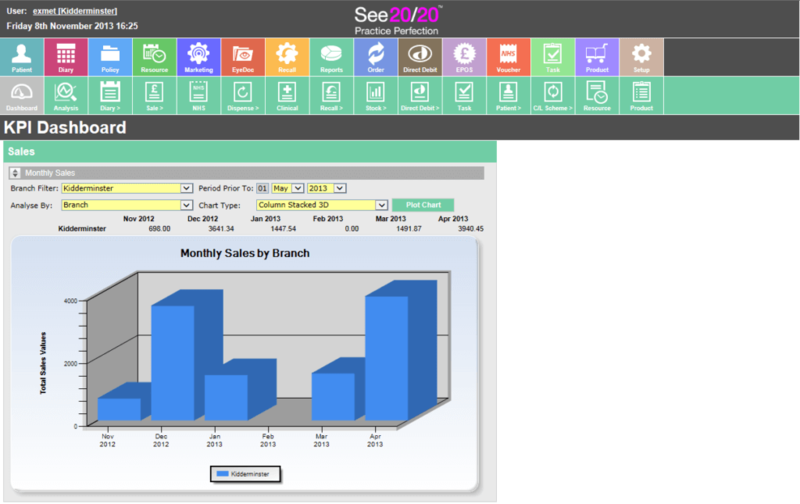 See20/20 Business Intelligence reporting provides a comprehensive view of your business data, supporting operational, managed, planning, budget and forecast reporting, there is also a facility to create ad-hoc reports. The Business Intelligence tools and dashboards will enable you to make those business critical decisions quickly and confidently, displaying data with clear and effective graphs and charts. Users can use this feature to see their concurrent business data, to make pro-active decisions with the aid of benchmarking and Business Intelligence tools, using visual aids like the real-time dashboard. Further, the user can Identify and benchmark their strongest & weakest areas of practice by highlighting and creating bespoke dashboards. Management can react quickly to replicate good results or combat poor performance. This feature also provides data analysis on all aspects of recall and reminder appointments generated, as well as data analysis on revenue generation from marketing communications and campaigns.